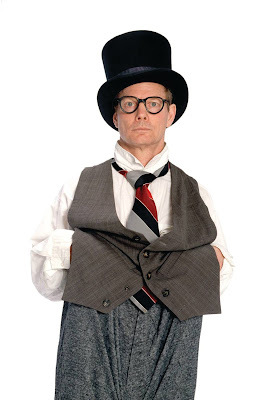 Bill Irwin. Photo courtesy of Bill Irwin. Bill Irwin may be best known to Bay Area audiences as a master clown, but he has also spent five decades immersed in the words of Samuel Beckett. It was in the late ’60s, as a student at UCLA, that he was introduced to Beckett’s language. In 1987, after exchanging brief letters with the playwright, Irwin met Beckett in Paris. The following year, Irwin joined Steve Martin and Robin Williams in Waiting for Godot at Lincoln Center Theater. Over the last two decades, Irwin and A.C.T. have developed a partnership for his Beckett explorations. In 2001, he performed Texts for Nothing at The Geary Theater, and in 2012, he followed up with Endgame, directed by Carey Perloff. On Beckett represents his third and most personal Beckett collaboration with A.C.T. The idea began to take shape three years ago. After a handful of performances around Seattle in 2014, Irwin presented the embryonic production the following year in three shows at The Strand, a theater that is rapidly building a reputation as a home of dynamic new work. How he’s back in San Francisco for a longer engagement at A.C.T. Before Irwin arrived at The Strand, we caught up with him to talk about Beckett, biographers, and baggy pants. What is your first memory of Samuel Beckett’s plays? The first thing I ever read was Act Without Words I. I was struck by the style and clarity of the stage directions (it’s all stage directions). Very memorable—though it’s ironic to me now because that play is one of Beckett’s writings that calls to me least, at present. I’m drawn to his use of spoken language now. What was it like meeting Beckett? It was 30 years ago; I was about to play Lucky in Godot—that’s what we spoke of most. I was very stiff, nervous, and not as knowledgeable about his work as I wish I’d been. I wish I could meet him now—with his voice and language having echoed in my mind. I’d have asked about Texts for Nothing and about the structure of Godot and Endgame. Contemporary playwrights are sometimes compared to Beckett. What makes him such a yardstick? His is an unforgettable voice, whether it’s your taste or not, and he changed everything. Anyone whose characters look at questions of existence—with humor, not pedantry (and sometimes humor about pedantry)—is going to get compared to Mr. Beckett. On Beckett opens on Tuesday, January 10 at The Strand Theater at 1127 Market Street, San Francisco. Check our website for tickets.